Eating and drinking is a rather mundane activity. Most of us eat at least a couple of meals each day. We might even have a few snacks in between. In many ways eating and drinking are simply habits. We get up, have some breakfast, and maybe a cup of coffee. Then sometime around noon, we probably eat another meal. Finally, sometime in the late afternoon or early evening, we have another meal. These meals can be elaborate or they can be simple. Eating alone is different than eating with others. So, do you ever think about how God might be present in such a normal activity as eating and drinking? Disciples gather at the Table at least weekly. At least in theory we believe that the Table stands at the center of our worship and our spiritual life. It’s from this Table that our mission in the world extends. The worship grant we received from the Calvin Institute of Christian Worship is focused on helping us better understand the relationship between the Table and our missional calling. In a few weeks time Ruth Duck will be here to help us further unpack this connection. Sitting in silence isn’t something we do very well, but maybe we should take a moment of silence to let the experience of the Table wash over us and then seep into our cells. Perhaps in the midst of this experience we will encounter God’s presence in our midst. Of course, each of us will experience the moment differently, because we each bring something different to the Table. Some of us might be ready to fully open our lives to God and receive the abundance of God’s grace. Others might come to the Table filled with doubts and maybe even a bit of resistance to God’s presence. The important thing to remember is that none of us is beyond God’s reach. Last week when we gathered for World Communion Sunday we heard Jesus share a parable about dinner parties and guest lists. Today we’ve heard a brief portion of the Exodus story. The people of Israel are camping at Mount Sinai. Moses has consecrated the camp site with sacrifices. 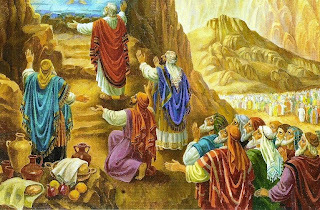 On the other side of our reading Moses and Joshua will climb the mountain and receive the stone tablets from God. This is an important moment in the life of Israel, but right in the middle of these two events stands this encounter with God. Moses, Aaron, some of the other priests and Elders climb further up the mountain. Then the narrator tells us that they “saw the God of Israel.” How can this be? Later in Exodus, we’re told that no one sees God and lives (Ex. 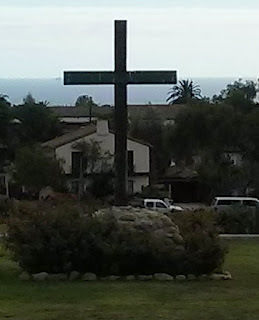 33:20). And in the Gospel of John, Jesus tells the disciples that no one has seen God, that is, except for the son “who is close to the Father’s heart, who has made him known” (John 1:18). The narrator doesn’t tell us what they saw, except that the pavement under God’s feet was “like the very heaven for clearness.” And, we learn that God didn’t lay a hand on them, which I take to mean, God didn’t strike them down. Then the narrator tells us that these leaders once again “beheld God.” That is, they gazed upon God. Walter Brueggemann suggests that the author paints a scene of a “stunned, astonished silence.” [NIB, 1:881]. There’s that silence once again, something we don’t do well with, at least I don’t! I don’t know if any of us has had an experience quite like this one. I’ve been near people of great fame, and for the most part I’ve kept my mouth shut. It wasn’t because I was awestruck. I was just trying to be respectful and unobtrusive. I didn’t want to be like the person who confronted John Cleese in the hospital hallway and asked for his autograph as he waited for information about his wife’s surgery. That’s not the kind of silence we have here. They couldn’t speak, because words didn’t fit the moment. While they appear to have been silent as “they beheld God, . . . they ate and drank.” Even though they were overwhelmed by God’s glory that didn’t keep them from eating and drinking. Why is that? Even if we don’t see God’s face when we gather at the Table, we’re still eating and drinking in the presence of God. We’re not just remembering a meal that Jesus hosted long ago, we’re siting at a Table where Jesus presides and invites us to eat and drink in the presence of God. These elements that we eat and drink are rather ordinary. There’s nothing inherently holy about the bread or the juice. Last week we did get to choose our bread, and there was a nice variety of bread available, but it was still bread, which we dipped into grape juice. Nonetheless, these elements have the power to communicate something very special. That is, a word of grace and reconciliation. God reaches out to us through this meal, so that we can reach out into the world with the same grace that God has extended to us. Something special happened as they gazed upon God and ate and drank in God’s presence. Joey Jeter writes that “when people are eating and drinking in holy moments, the focus is on God and not just on our stomachs. The same goes for the Eucharist. It is a personal and communal moment with God that can spread to involve especially those in need” [Preaching God’s Transforming Justice, C, 418]. As Jamie Smith reminded us at the Streaming Conference at Rochester College, we gather, listen, commune, and then we’re sent. That is, we gather to be scattered, but in the midst of the gathering, we eat and drink in the presence of God. In these moments at the Table, as we eat and drink, if we’re open to the moment, we might experience grace and reconciliation so that we might go into the world filled with the love of God and of neighbor. As they ate together Jesus asked Peter three times, “do you love me more than these?” And each time Jesus asked the question, Peter said that he did love Jesus. Then Jesus invited Peter to first feed his lambs, and then take care of his lambs. There’s something in this exchange that is meant to restore Peter to full communion after his betrayal, and Jesus does this by commissioning him. I learned something yesterday about what Jesus meant when he asked whether Peter loved him more than “these.” Jaime Clark-Soles suggested that the word “these” refers to Peter’s old life; that is his decision to return to his comfort zone, which was fishing. God revealed God’s self to Moses and his companions on the mountain, and they ate and drank in God’s presence. May we eat and drink in the presence of God and receive grace from God, so that we might love Jesus by tending the sheep as we go out into the world in peace. Let us, therefore, go to the Table of God’s presence!